You may have recently heard of the plans of the HS2 second phase, running from the West Midlands to Leeds & Manchester. I have put together some information on the impact that this will have on those of us in the Ashby de la Zouch area. There are hundreds of websites which give detailed information on the implications of HS2, but I wanted to create this page to attempt to show how it will affect us in North West Leicestershire. The plans will devastate local communities, countryside and, in particular for our area, stretches of the National Forest. Your life will be affected if you are living in the vicinity of the track, 225mph trains are not quiet! 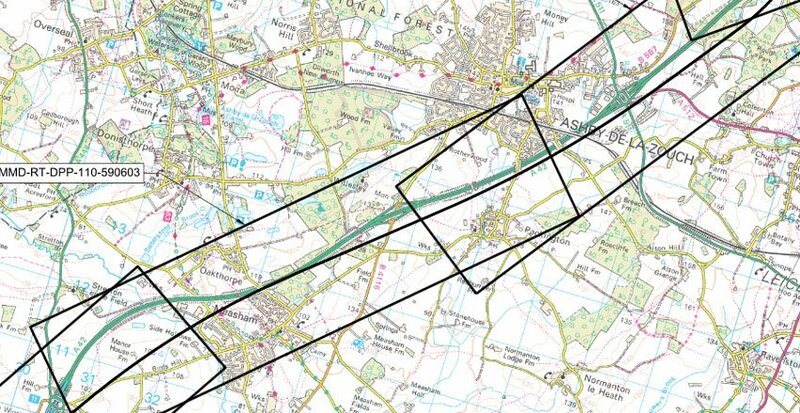 In NW Leicestershire and outlying areas, residents of Ashby de la Zouch, Coalville, Measham, Packington, Worthington, Austrey, Appleby Magna and many other areas will likely be impacted by noise pollution as well as physical and permanent scarring of our countryside. The government claim that HS2 will “Bring major cities closer together” and “generate investment in neglected areas”. In fact it will just mean that more will commute from the North and the midlands to London, increasing the North/South divide. In the short term there will be job creation. However the manufacture of trains and other components will no doubt be sourced overseas from Hitachi and other preferred government suppliers rather than manufacturers in the East Midlands and the rest of the UK. The intercity services on the West Coast Mainline are set to be cut to make way for HS2. With the cost of traveling on HS2 set to be much higher than the standard service the average commuter will pay much more overall. All in all the biggest benefits of HS2 are likely to be for those in London and the South east, and perhaps the immediate areas surrounding the stations (the nearest station to Ashby de la Zouch is planned to be Toton, approx 19 miles by road). For the rest of the country, other than a slightly quicker journey time to London for Christmas shopping, I can see no benefit! How Much will HS2 Cost? The UK is supposedly taking painful austerity measures with huge cuts to services and infrastructure, yet the Government is adamant on spending £34 billion on a service that will only benefit the richest in society. The initial forecast for HS2 will see over £34 Billion spent on this project. To put this into perspective, Andrew Bridgen claims that this will cost North West Leicestershire over £400 million. Other sources claim it will cost taxpayers around £1000.00 per household! This is based on figures which are estimates, and as we have learnt from other government led spending in the past, this figure is likely to increase significantly. All of this when there will seemingly be no benefit to tax payers in this area. The last venture, HS1, at a cost of £7.1 Billion (over £4 billion written off, plus government grants of £1.3 Billion) has seen passenger numbers of only a third expected in the forecast, and train sizes and services have already been cut. The wheels were set in motion by a Labour party established company High Speed Two Ltd and unfortunately our Conservative/Liberal Democrat coalition is continuing with the plans. HS2 represents an unprecedented cost that the taxpayers of North West Leicestershire will be required to contribute to. HS2 Ltd ‘s own estimates indicate a total cost of construction of the new network of £33 billion plus a further £8 billion for rolling stock (2009 prices). These amounts arguably represent an unprecedented commitment from a UK Government in peacetime. These costs equate to a contribution of over £51 million from every UK parliamentary constituency including North West Leicestershire. Put another way, Leicestershire as a whole will be contributing over £400 million to a scheme from which I believe it will receive little benefit. I would much prefer that money to be spent on local infrastructure. I also have concerns that rather than rebalance the economy away from London and the South East, the scheme will simply draw more investment and money into the South East and away from the regions. An example of this is Thanet in Kent which remains one of the most depressed areas in England; although it is served by direct High Speed One services to London. Update, 30/01/13 Our own Mayor, Geraint Jones was quoted by the Burton Mail as saying “The train line has to go through somewhere and the Government obviously feels Ashby is a natural line for it to follow”. An investigation by the Independent on Sunday has revealed that HS2 threatens 350 unique habitats, 50 irreplaceable ancient woods, 30 river corridors, 24 Sites of Special Scientific Interest, a national nature reserve, 10 county wildlife trust reserves and hundreds of other important areas. All told HS2 will effect a wildlife area the size of Dorset. If this petition gets enough support I will forward it on to the Stop HS2 action group as well our MP Andrew Bridgen. Please note, unfortunately some signatures have been lost from this petition. If your name is missing, please sign up again.